That picture of goodness right there is a Dole Whip Smoothie Bowl. Authentic Dole Whip is a creamy pineapple frozen soft serve treat which is only made and served at two places in the world - Disneyland and the Dole Plantation in Hawaii. And we've been craving it big time since we got home. 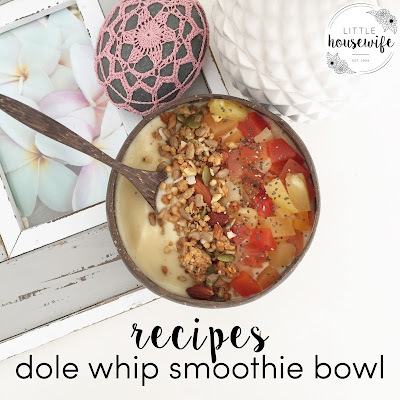 A bit like the 11 secret herbs and spices, no one knows the exact Dole Whip recipe but there are heaps of versions out there. This is my healthy take on this delicious, iconic treat. It's really quick and easy to make and is best eaten straight away. The only thing you need to do in advance is freeze the fruit. Once you've got frozen fruit you're good to go. Where my recipe breaks with tradition in that I add a frozen banana to the mix. I find this creates a smoother, creamier consistency and also stops it from melting so fast but feel free to leave it out. I also use coconut milk for a healthier option but normal pouring cream works just as well. Use whatever toppings you like - as there's no summer fruit about in New Zealand at the moment I used a Dole Tropical Fruit Bowl to embrace the island flavours but fresh strawberries, frozen blueberries and sliced kiwifruit would be delicious in summer. Read on as I have a fabulous Dole Pineapple Party prize pack to giveaway to one lucky reader. In a high powered blender add frozen pineapple, frozen banana and coconut milk and blitz until smooth and creamy. You may need to stop and scrape down the blender every so often if the frozen fruit gets stuck. Resist the urge to add more liquid or you'll end up with a soupy liquid! You want a soft serve consistency or firmer. Once it gets going it'll be fine. An assortment of eight packets of Dole Fruit Bowls including fruit, jelly and custard varieties plus a fun selection of pineapple party supplies including honeycomb pineapple decorations, pineapple cups and plates, serving tray, cutlery and balloons. Sounds fun huh! To enter simply let us know which Dole Fruit Bowl you and your family would enjoy most - Fruit in Juice, Fruit in Jelly or Fruit in Custard? They are all good FYI! Oooh yum! We love fruit and custard! Perfect kindy snack too! YUM! 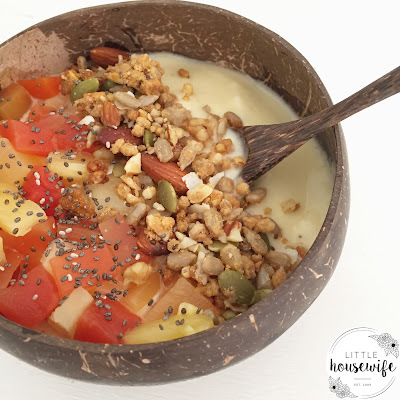 This recipe has all my favourite fruits, definitely going to give it a go!! Thanks for the recipe great inspiration and simple too. They all sounds so good especially Fruit and Custard! Fruit and custard would be a favourite in my household! !